The most important thing about watching a movie is who you watch it with. In the age of today, it’s really difficult to gather your nearest and dearest together to watch something in the cinema- and even then by the time you do, the movie is off the circuit. Having a home theater designed by Ergo Audio makes this all so much easier; have the fun of the theater but from home, and with luxury and style! At Ergo Audio we can create custom home theaters that suit your style and budget. Whether you are building out a basement or if you want to convert an existing room into a theater, we can help. 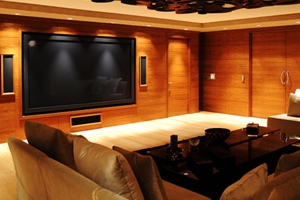 We have extensive training on the construction of custom theater rooms from the conception to the final product. We have been in the business for more than 20 years and consider ourselves masters of the audio visual market. In our showroom we display one example of many options for a dedicated theater room. If setup correctly your theater can deliver all of what DVD, and HD satellite and cable have to offer. Whether you dedicate a room or borrow space in a living room or den, Ergo Audio can help create an experience everyone in the family can enjoy. We can offer you the best solution for your home theater needs that will give you more time with your and family- by giving you a space to relax in and enjoy together! Call today to take full advantage of a home theater room by Ergo Audio.